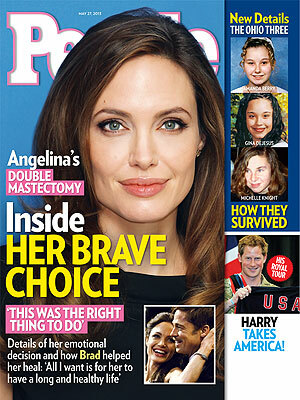 -In the new issue of People (which — it should be noted — features Angelina Jolie on the cover, but contains no actual interview with her), they reveal that her next step is to have her ovaries removed. –Joshua Jackson‘s reaction when Diane Kruger reveals in this video that they like to skinny dip slays me. I’m pretty sure I’m going to revisit this GIF of it on a daily basis. -Remember when Jon Hamm and Adam Scott recreated the Simon & Simon theme song shot-for-shot? Well now Adam is teaming up with Amy Poehler to take on the Hart to Hart theme. -It has taken The Mindy Project all season to work out its kinks, but last night’s finale was fab. -Speaking of last night’s finales, Taylor Swift’s cameo on New Girl was super short and featured no singing(?? ), but at least Max Greenfield seemed to like it. -TBS is giving Diablo Cody her own talk show. I love and adore her YouTube series where she interviews celebrities in an old trailer, so this could be good. –Lindsay Lohan is not quite ready for people to mock her…to her face. -The pilot for The Goodwin Games is now online. I really liked it, but Fox is burning it off this summer so don’t get too attached. -Here’s the first Arrested Development viral campaign. –Jennifer Love Hewitt just dropped $3.25 million on a Pacific Palisades mansion. –Diddy just tweeted that he’s joining the cast of Downton Abbey, but PBS assures us that he most certainly is not. It was just for a Funny or Die skit. -In other rumour news, Eminem was not almost stabbed to death in NYC. -Speaking of The Office, Grantland’s collection of the show’s best clips sent me down a very engrossing YouTube rabbit hole today. And then I hit this video of the cast saying goodbye and tearing up, and I was done for. –Ricky Gervais is bringing back David Brent on YouTube and that should make us all happy, but reading this new GQ interview may make you hate him too much to care. –Lupe Fiasco‘s management took control of his Twitter after the rapper started a (very intelligent) conversation about Marxism. -A day after claiming she’s single, Selena Gomez was spotted at Justin Bieber’s house. –Reese Witherspoon‘s publicist wants you to know that the actress and her husband showed “great chemistry” while shopping in NYC. -For those of you keeping track, Miley Cyrus‘ ring is back on. –Will Smith and Jaden Smith laughed off those emancipation rumours on today’s Ellen. –Nicki Minaj is done with Idol, while Shakira is leaving The Voice. -I love the dress Nicole Kidman wore to Cannes. Carey Mulligan looked amazing too. This bodes well for the rest of the week! –Diplo live-tweeted his bitchy thoughts about the new Daft Punk album while listening to it. -I don’t know how I missed the August: Osage County trailer when it debuted last week, but it stars everybody! And by everybody I mean Meryl Streep, Julia Roberts, Ewan McGregor, Benedict Cumberbatch and a whole bunch of other pretty people. Oh, and it’s produced by our fake boyfriend, George Clooney.